This English lesson 30 is focusing on regular verbs in the simple past and the spelling changes that happen. S + bare infinitive + -ed + O. He workED there for five years. Yesterday we stayED with our uncle and aunt. today’s lesson and I think I do go over and over this during the recap video. In the grammar section of today’s lesson that’s also something that has been emphasized so do pay attention to the pronunciation because if you don’t have any bad habits you don’t have to relearn. So try and learn it perfectly today and you will feel very confident speaking in the simple past so that’s for grammar and pronunciation. As for vocabulary you always have some idioms and everyday expressions and everyday vocabulary. So also play with that new vocabulary make your own sentences. And if you want to share your feedback your examples your questions don’t forget to post in the comment section below and as usual for those that have been with me since the very beginning you’re going to say Julia repeats herself well there are some things that I have to repeat please do turn on their subtitles start off with English then your mother tongue back to English and then turn them off. It is a challenge but it’s a very good challenge it will really boost your capacity to not only concentrate but also understand. That’s it guys now I’m just going to let you follow the structure of the lesson which is: dialogue, vocabulary, grammar, questions and answers and then recap. And that is where you and I coincide again today to review the main points of today’s lesson. Well now that you study and I will see you later. Bye for now. The simple past of regular verbs and the spelling changes that occur as a result. Let’s go and eat we can continue this discussion at the dinner table. I am sure that we are all starving. Sorry, Jeanne, I hope you don’t mind being corrected. Not one little bit. The problem is that people let you make mistakes. They never correct you. They think it is impolite to do so. In a class with other students, you just learn rules. The teacher has not the time to correct each mistake. The student thinks he has learned the lesson but he makes mistakes. It is refreshing to be with people who care enough.It is also very good to talk to people who can explain properly. Thank you. In many language schools, the teachers are not qualified to teach correctly. They learned English intuitively. Then they try and explain English with a grammar book. English is a mix of different grammar systems: Latin, German, French, Celtic pre-roman English and many more. I learned grammar but native people who listened to me did not understand me. This was because of the fact that I pronounced very badly. I find that the past tense in English is easy for regular verbs. You just have to add ed. They think it is impolite to do so. Regular verbs in the simple past or past simple. Last year he playED football every week. The other day I startED to feel ill. In August I passED my driving test. We crossED the road carefully. We wantED to travel to the UK. He askED me for advice. S + did not / didn’t + bare infinitive (infinitive without “to”) + O. Some spelling changes sometimes occur! Did he live in Ireland? Yes, he lived there when he was 10. How long did you learn English for? I learned English for two years. How often did you go to school for? I went to school every day for five years. Yes, I opened the book I read and I learned something new. Did you read about red Indians? Yes they used to live in tents. Can we continue the discussion at the dinner table? Yes, I am sure we are all starving. Do you mind being corrected? No, not at all, it helps me a lot actually. Did your teacher correct you at school? No, he did not have the time. Was your English teacher Spanish? Do I pronounce so badly? No, but you cannot make certain sounds. Let’s look at another vowel sound ai, called diphthong also pronounced diphthong. ai, keep your mouth wide open and your lips relaxed, your bottom jaw is slightly down, your tongue is tense and at the back of your mouth. a. say. late. eighth, April, away, survey, rain. Let’s repeat, a. say. late. eighth, April, away, survey, rain. Now test time, how would you pronounce these words?The answer is, afraid, great, name.That’s it for today see you soon. 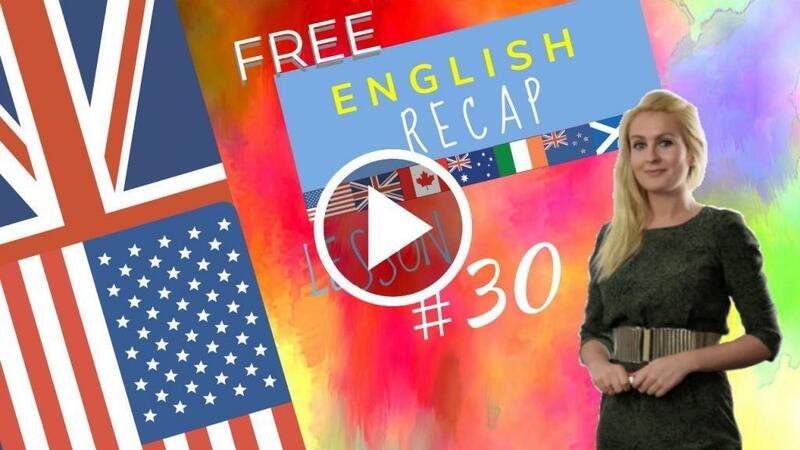 Today we’re going to do the recap of lesson 30 together, the very last lesson of level A2. So I hope this isn’t the last time I see you! pronunciation, followed by vocabulary and grammar. Now we’ve seen this point before, in lesson 28. Why are the -ED endings and their pronunciation so important? So the -ED ending unless it’s pronounced or pronounced correctly, it may sound as if you are speaking in the infinitive and not the simple past. It is just for precision really – to be better understood. Let’s start off with that. Our -ED endings can be pronounced: /d/, /t/, or /id/. Now let’s look at your key words that I’ve taken from your dialogue and grammar and question and answers of today! Now let’s move on to your grammar point of today. So with me, all we’re going to do, you and I, is look at the screen here. We’re going to have different examples that will appear. But focus on what we’ve just done which is pronouncing the -ED ending correctly. So the verb will appear, either with the -ED (positive/ affirmative form) or with no -ED (interrogative or negative form). They passed their driving test. We focused on the -ED endings. They opened their grammar book. They used the grammar book. The rules helped me to memorise. We decided to take three lessons per week. They did not help me. I hope that you’ve enjoyed doing these recap videos together! I look forward to seeing you in our next adventure: the B1 level!